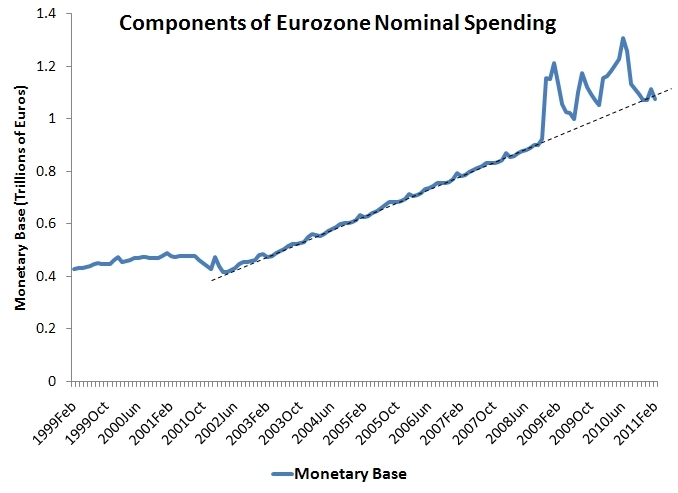 Is the ECB Actually Targeting the Monetary Base? Look at the figure below. 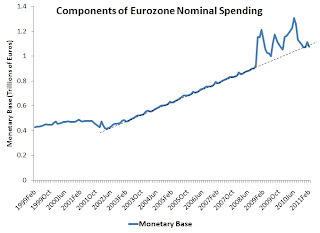 It shows the monetary base for the Eurozone and the data comes directly from the ECB. The monetary base follows a striking trend that begins in 2002 and continues to the present. Even the financial and Eurozone crises create only temporary deviations from this trend. This trend is so straight it creates the appearance that the ECB is actually targeting the monetary base rather than following its two pillar strategy. Other than a brief run up in late 2001-early 2002, the money multiplier had been relatively flat prior to the financial crisis. 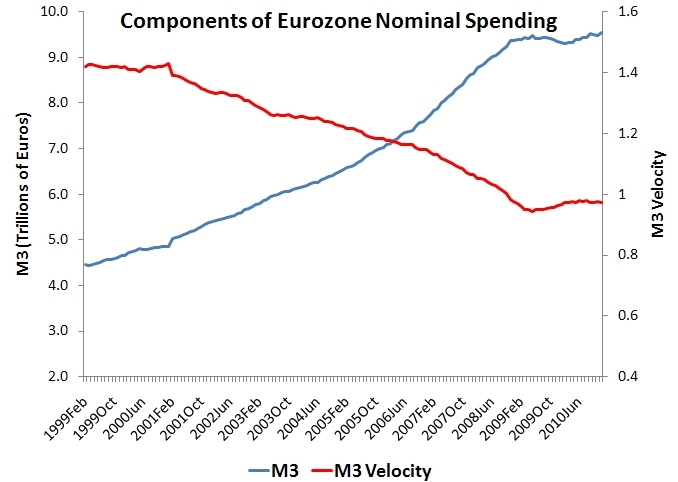 Thus, most of the M3 money supply growth has come from increases associated with the trend growth in the monetary base. 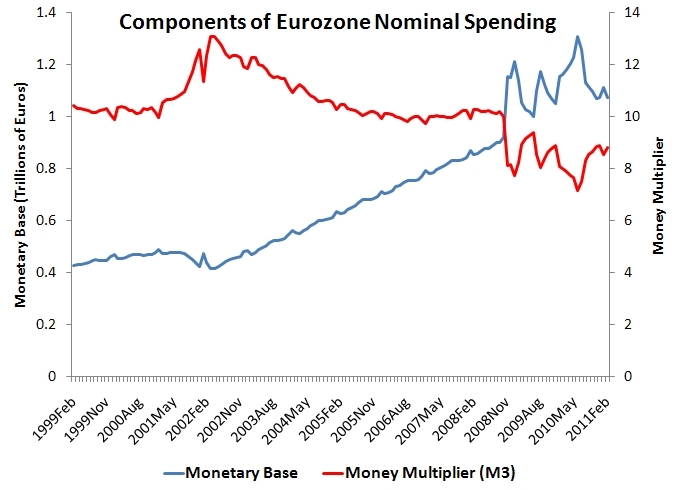 After the financial crisis, the monetary base seems to adjust to the shifts in the money multiplier as an offset. The figure below shows M3 along with velocity, the third component of the above identity. 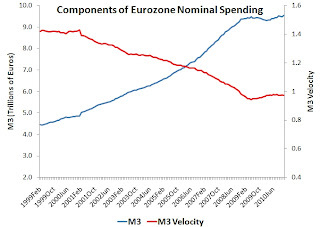 Here we see a sustained rise in M3 being offset by a sustained fall in velocity up till the financial crisis. This drop in velocity seems strange given that it occurs during the housing boom. So it seems the ECB was increasing the monetary base fast enough to keep nominal GDP growing at a stable pace. 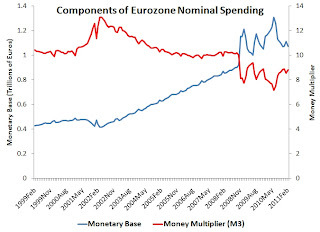 While that can explain the upward trend in the monetary base, it does not explain (1) why the trend was so straight, (3) why the money multiplier was relatively flat, and (3) why velocity was falling. Could it be the ECB was secretly targeting the monetary base via some kind of Bennet McCallum-type nominal GDP rule? Originally published at Macro and Other Market Musings and reproduced here with permission.